Since BnB2 was completely full last time I checked, I needed to pull out a couple of bars of capped honey to make some room. The nice thing about top bar hives is that you can open up the back, steal a few bars and close it all back up without disturbing most of the hive. And using the crush and strain technique below, you can process just a couple of bars pretty easily. 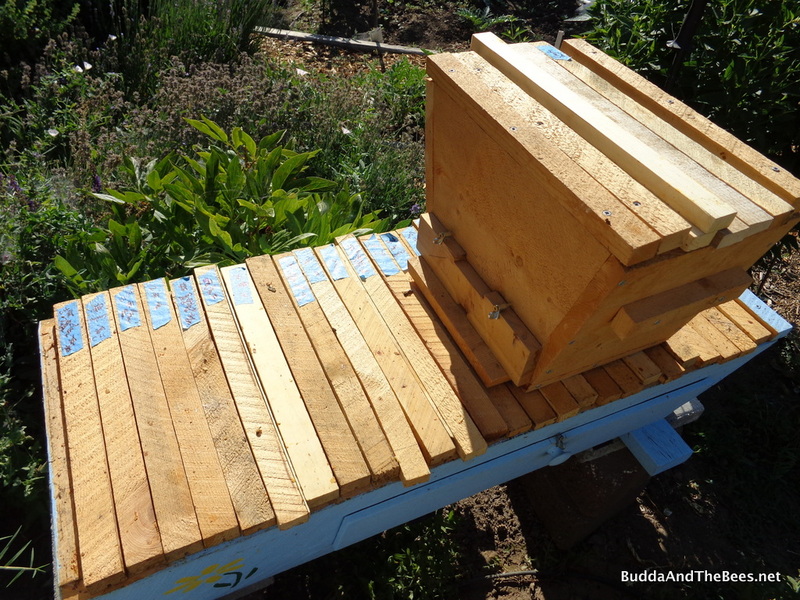 During the last inspection, I moved 2 fully capped honey combs to the very back of BnB2, so it should have been an easy in and out. Unfortunately, the last bar was right up against the wall. I fashioned a slim cutting tool out of a coat hanger, but I just didn’t have enough room to use it (but will be useful in the future). I also tried to make a one piece wedge bar following the instructions from my friend Julie over at Happy Hour At The Top Bar to replace the combs I was stealing. She has much better woodworking skilldazzles (and better tools) than I have. Mine is a bit wobbly, but I used it anyway. So, I took my chance that the comb wouldn’t break and lifted it out, and fortunately, it all came out in one piece. Since it was right up against the back edge of the hive and the comb next to it, a lot of bees got crushed as I pulled it out, which always makes me sad. It also didn’t make the bees none too happy as you can see in the video below. The second bar came out much easier. It was on newer comb and looked delicious. Some people cut the comb right there next to the hive, but I find that I end up killing lots of bees that don’t get off the comb or fall into the bucket and get stuck in the honey. So, I put my combs in my little nucleus hive to carry to the processing place. 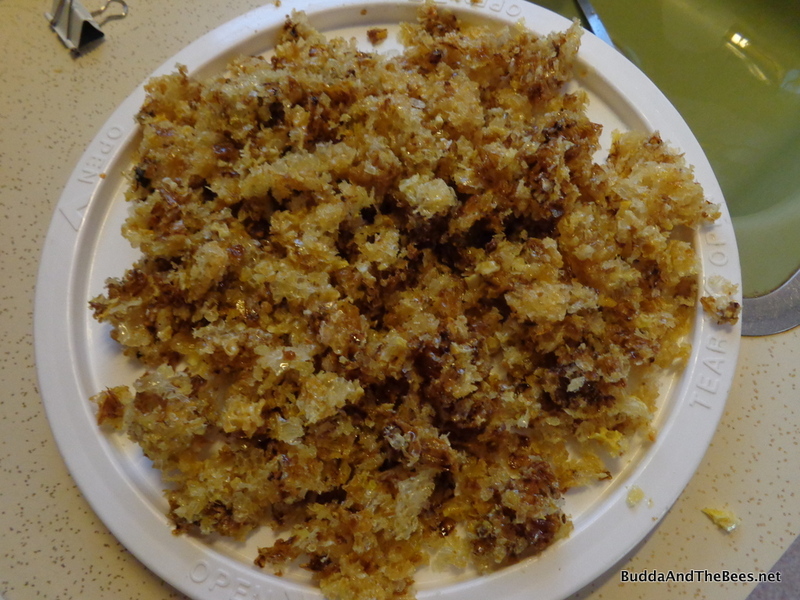 I brush off the bees before putting them in the nuc. Nuc to put combs into. I use my garage for my processing. 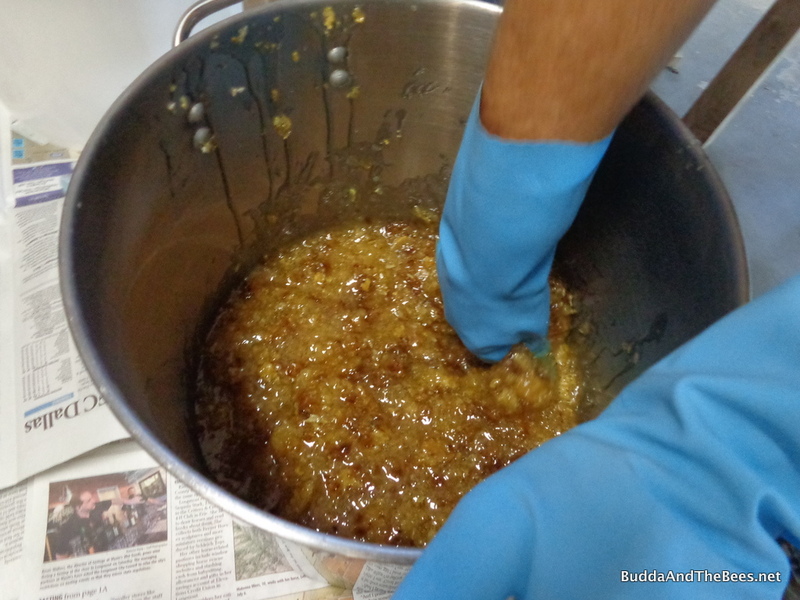 Extracting honey is a sticky mess. 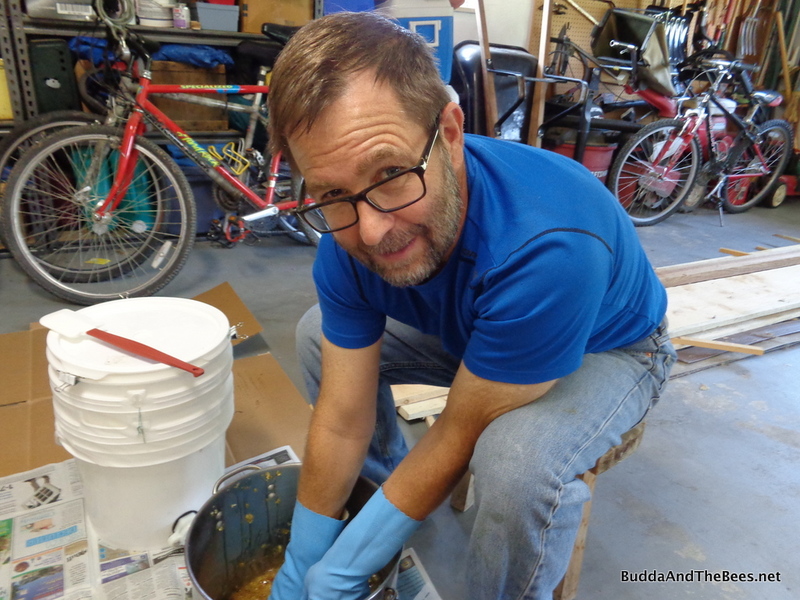 I think I will eventually set up a processing station in my basement, but since the garage is a straight shot from the hives, it’s easier to do it there for now. 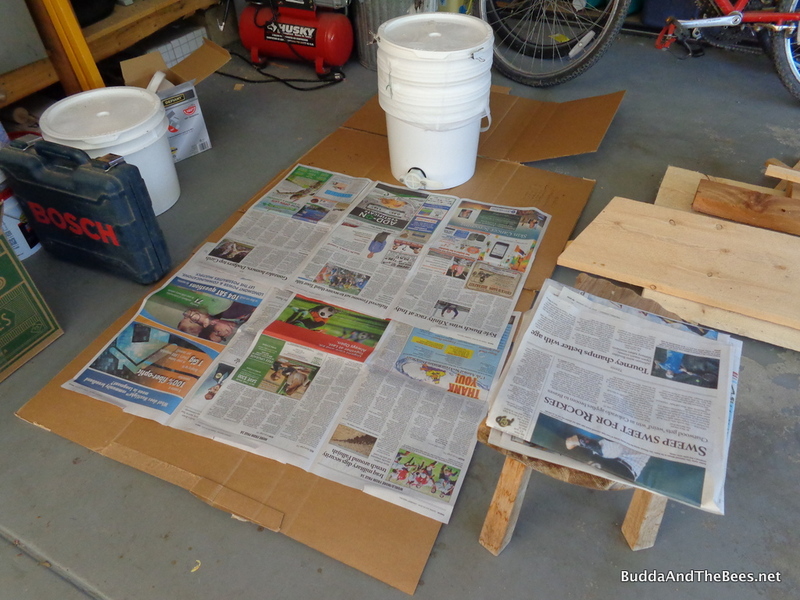 I blew out all the dirt and debris that was hanging around and put down some cardboard and newspaper to keep the area cleaner. 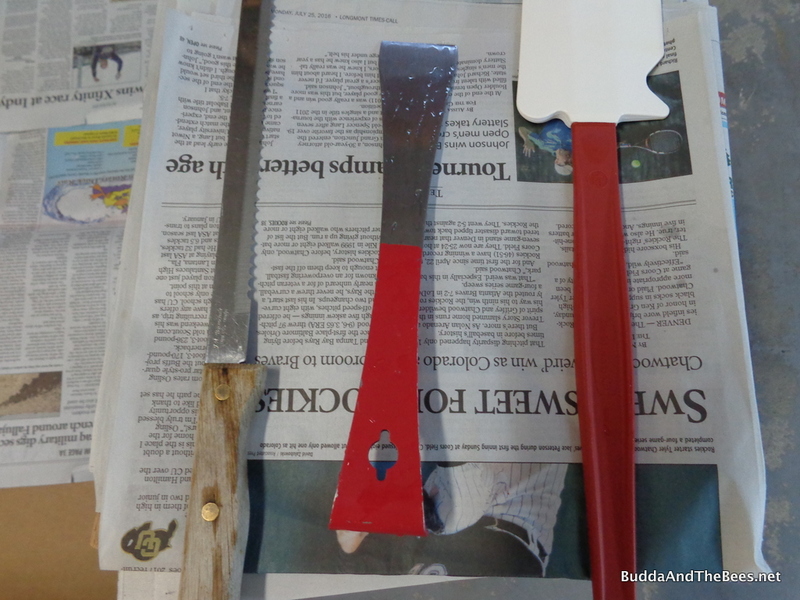 I got my tools all ready – the knife for cutting the combs, the hive tool for cleaning off the combs and the spatula for scraping out the bucket. 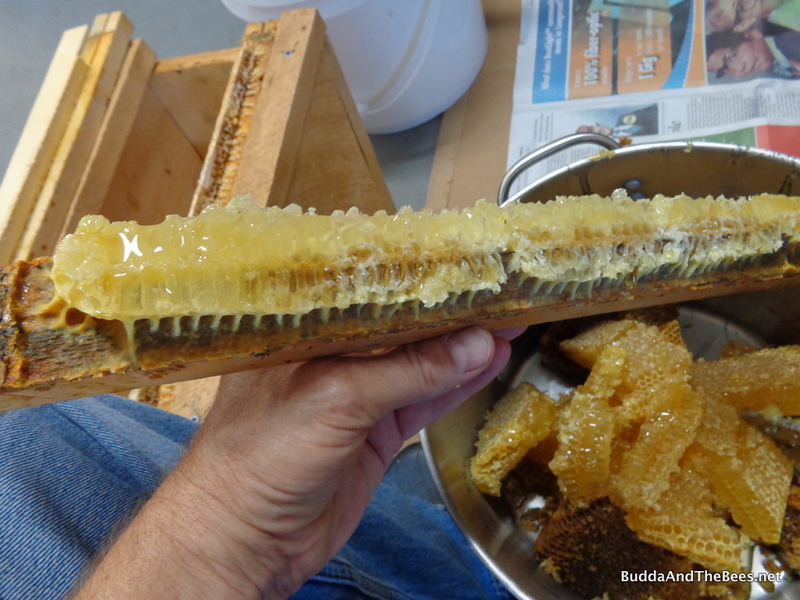 Second comb after cuts – yummy goodness still on the comb. 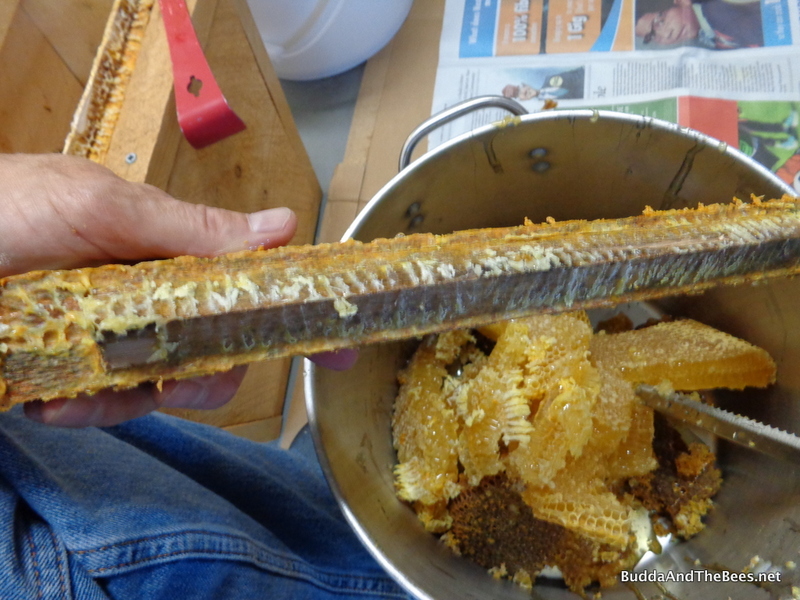 I try to get all the comb off the bar using the hive tool. The second comb was one of my two piece wedge bars – a bar with a piece of triangular wood trim nailed on. 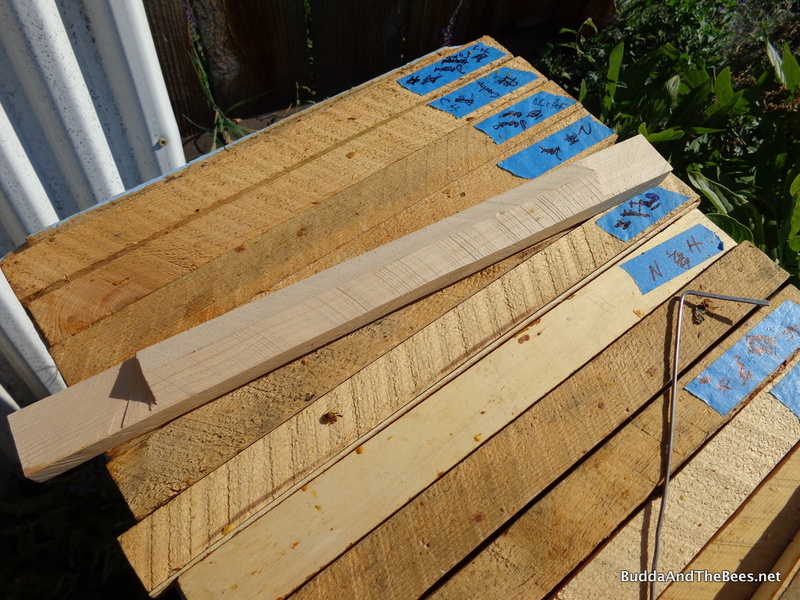 Much easier to make and less chance to lose a finger to the saw than the one piece wedges. Cleaned up two piece wedge bar. The next thing is to crush up the comb to release the honey. 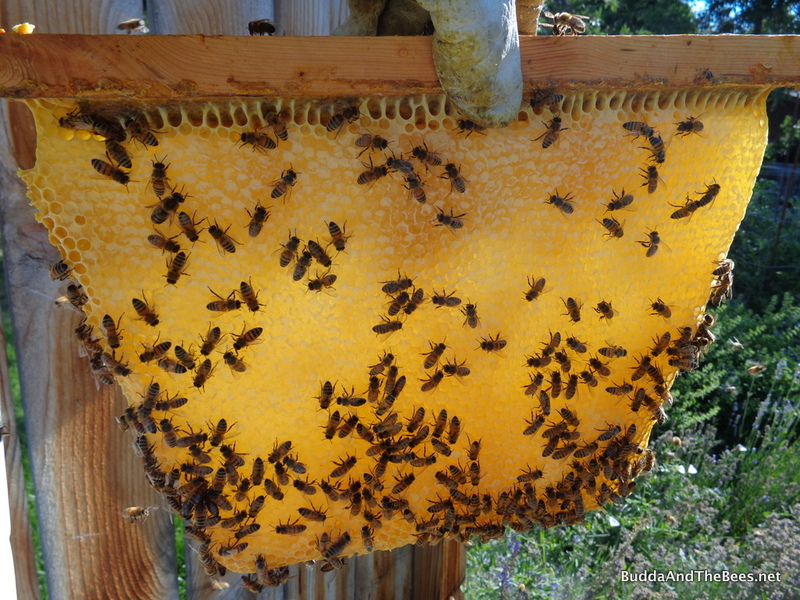 I use rubber gloves – I’m sure someone will tell me they are not food safe – because there is the occasional bee in the combs and I don’t want to get stung by a dead bee. 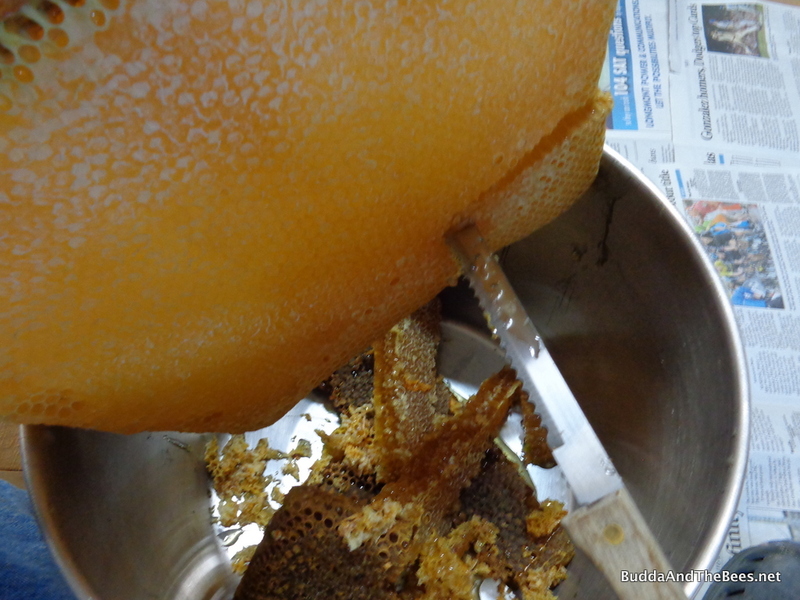 Once the comb is all crushed up, I pour it into the strainer. 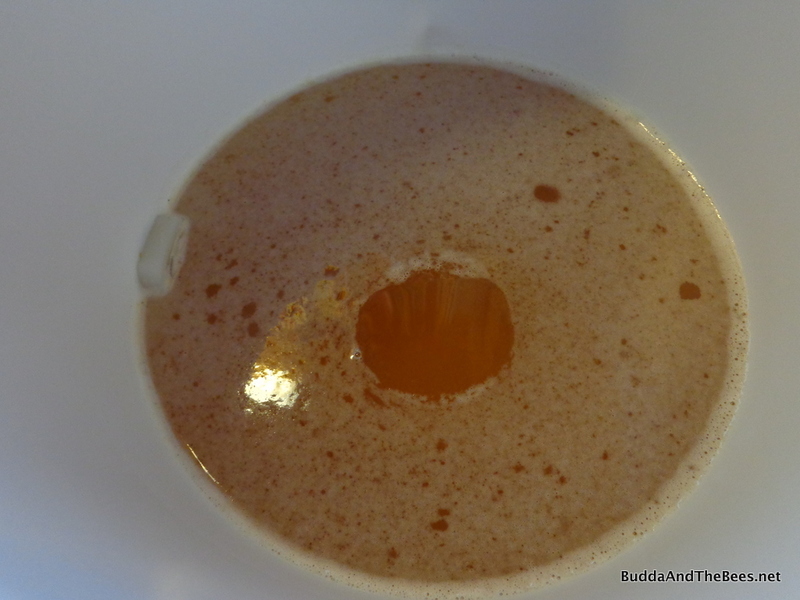 I use a paint strainer that I get at the hardware store – cheap and it works great. 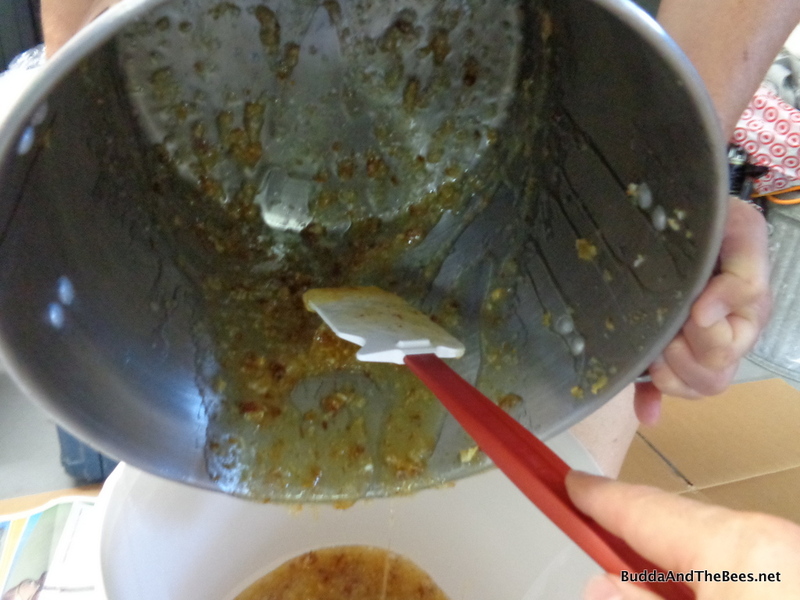 This particular honey strained really quickly. In the past, when I’ve harvested others, it took a bit longer (plus there were only two combs in this case). I was able to take the comb and crush it all before I went to work. 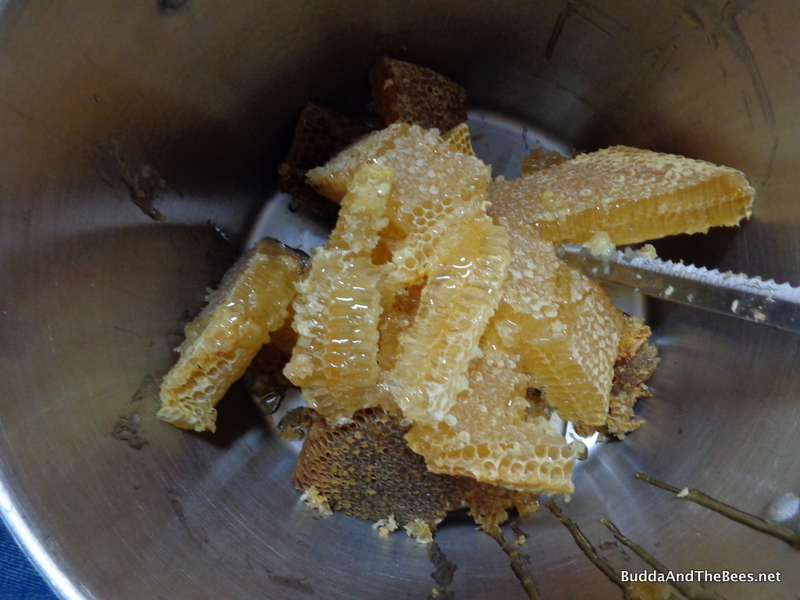 The next day, the honey was drained from the comb and it was time to bottle. I took a piece of Saran wrap and laid it across the top to remove the foam. It doesn’t get it all, but most of it. 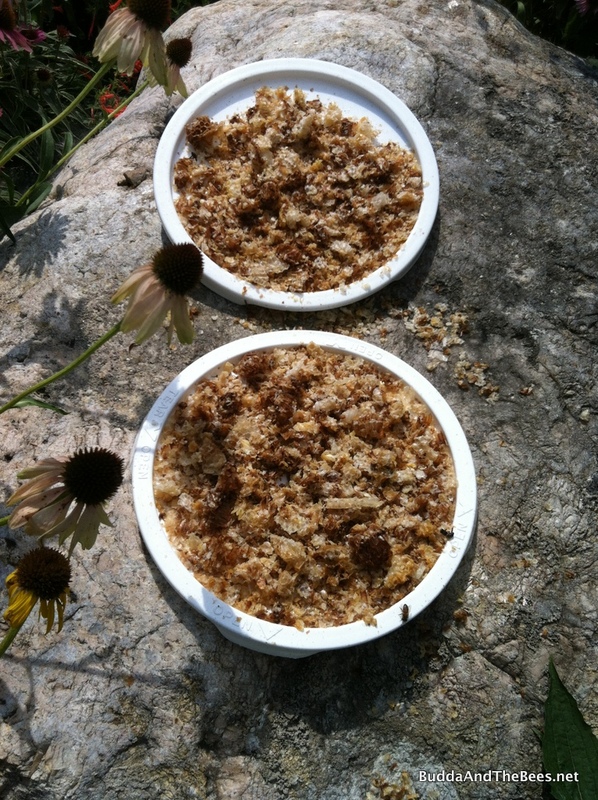 After straining the honey, I put the wax on the lid of the strainer and then put it out for the bees and wasps to clean up. I put it in my front yard, on a rock surrounded by lots of bee plants, away from the hive to prevent other bees from robbing the hives. I also put the bars out there to be cleaned up. 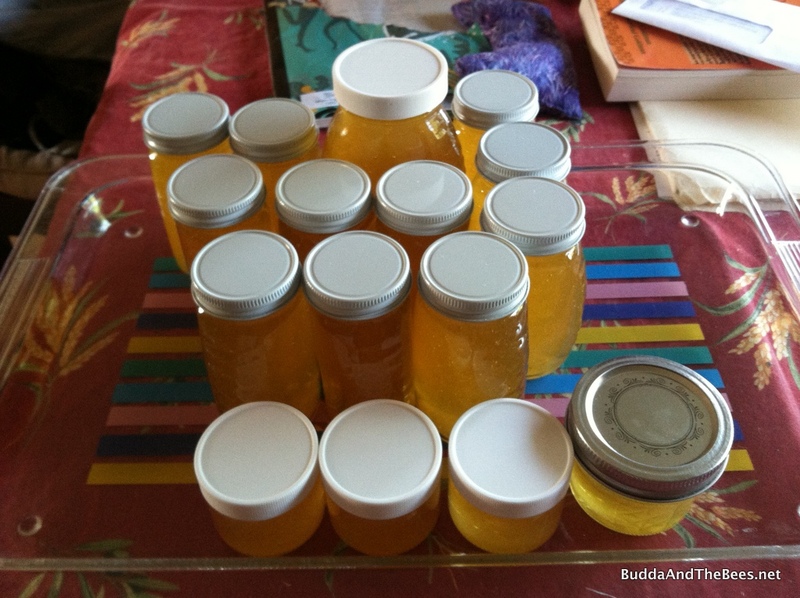 I bought some real honey jars this year instead of just using canning jars and bought some real lids to go with them. 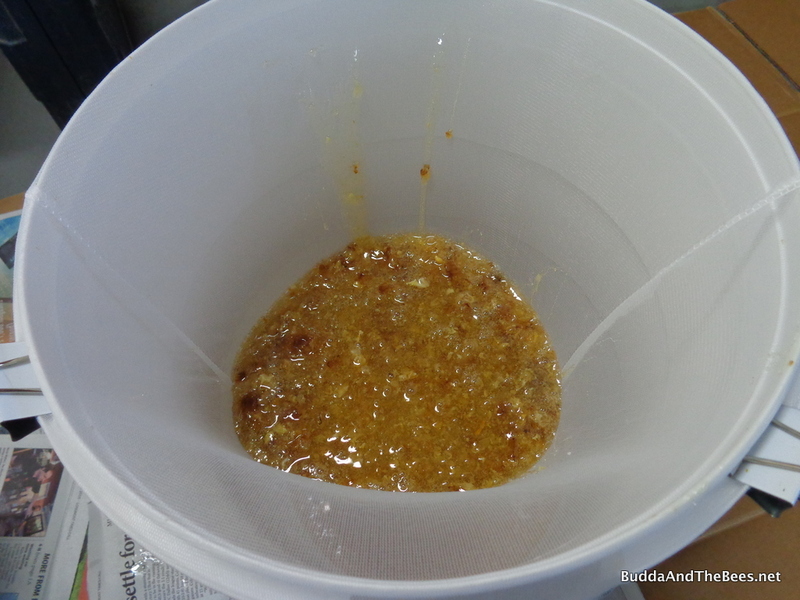 I ended up with 7 pounds of honey (honey is measured by weight, but essentially it was about 3/4 of a gallon liquid). I figure each of my bars from this hive weighs about 4 pounds (mine are narrower and shorter than some others). The best part of all this is getting to taste the yummy goodness. That’s the first hive to harvest this year, but the others have more honey for me. I need to keep enough for the bees to make it through the winter, but there’s plenty for all of us this year. The weather is supposed to turn a little cooler at the end of the week, so I’m hoping I can get in and harvest honey from the other hives. BnB1 and Hello Kitty should both have some bars that I can use for comb honey. Yum!!!!!! I’ve already given away all the honey except for a couple of jars that I kept for myself (maybe I’ll share with my family). I give it to people I know will appreciate it. One of my friends told me she finds herself making toast just so she can have honey on it. 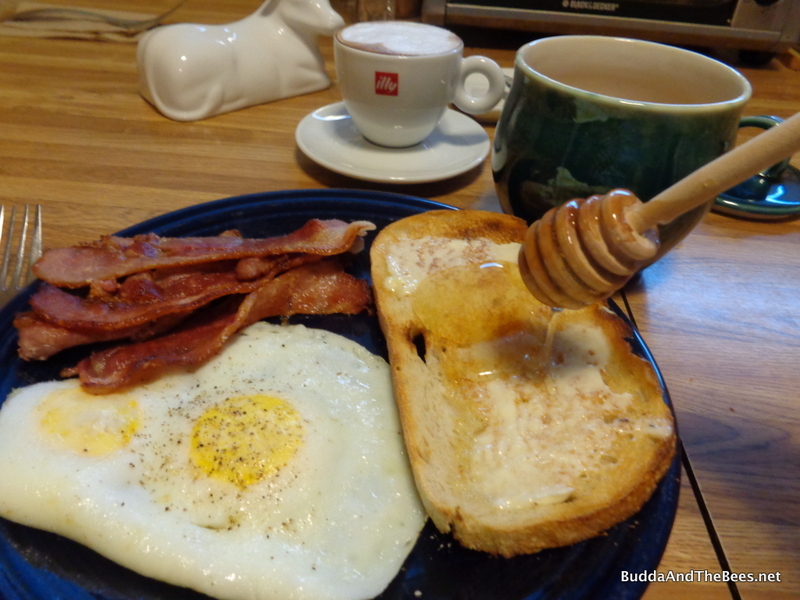 I feel grateful that I can share the bounty I’ve been given by my bees. Congratulations on your harvest! That’s quite a tidy haul from two bars. You always have the most gorgeous honeycombs. Those would be so nice for some comb honey. Your wedged bar looks quite nice actually — I have no idea what you’ve been on about! The second comb might have been nice for comb honey (first one was old & dark), but I’m holding out for the new white comb in BnB1. Steal away! I’m stealing your idea of colored tacks. I’m going to use it to date the combs using the queen year color so I can cull old comb. I’m really bad about tracking that.